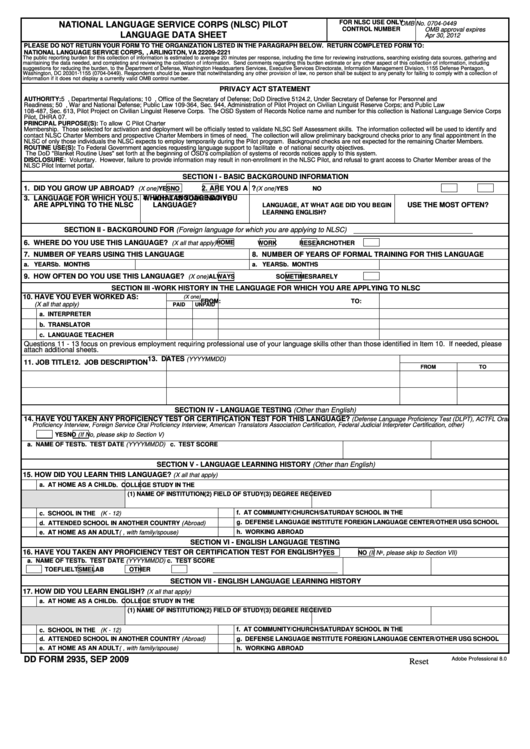 Download a blank fillable Dd Form 2935 - National Language Service Corps (Nlsc) Pilot Language Data Sheet - 2009 in PDF format just by clicking the "DOWNLOAD PDF" button. Complete Dd Form 2935 - National Language Service Corps (Nlsc) Pilot Language Data Sheet - 2009 with your personal data - all interactive fields are highlighted in places where you should type, access drop-down lists or select multiple-choice options. NLSC of only those individuals the NLSC expects to employ temporarily during the Pilot program. Background checks are not expected for the remaining Charter Members. 1. DID YOU GROW UP ABROAD? 2. ARE YOU A U.S. HIGH SCHOOL GRADUATE? 6. WHERE DO YOU USE THIS LANGUAGE? 9. HOW OFTEN DO YOU USE THIS LANGUAGE? 14. HAVE YOU TAKEN ANY PROFICIENCY TEST OR CERTIFICATION TEST FOR THIS LANGUAGE? 15. HOW DID YOU LEARN THIS LANGUAGE? b. COLLEGE STUDY IN THE U.S.
f. AT COMMUNITY/CHURCH/SATURDAY SCHOOL IN THE U.S.
16. HAVE YOU TAKEN ANY PROFICIENCY TEST OR CERTIFICATION TEST FOR ENGLISH? 17. HOW DID YOU LEARN ENGLISH?